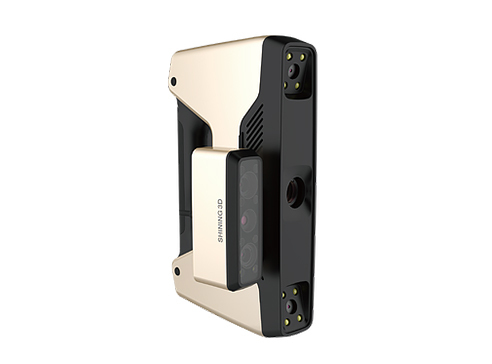 The EinScan Discovery Pack and HD Prime Pack upgrade SHINING’s existing hardware with color and further detail, contributing the company’s complete 3D scan to CAD solution. The EinScan Discovery is a tripod 3D scanner based on the EinScan-SE (Elite) and EinScan-SP models. In addition to a 3D surface, the Discover is capable of capturing color by using an Ultra-FineTM Hardware ISP video processing engine. At a rate of up to 3.0 megapixel per operation, color texture is captured at 12.0 megapixels – similar values as a digital camera. To help with the process, the 3D scanner also has a built-in 24-bit true-color display. The handheld EinScan HD Prime has two modes – one for rapid 3D scanning, the other for capturing finer “high definition” details. Essentially a souped-up EinScan-Pro+ the HD Prime’s Rapid Scan improves the speed of its predecessor by 30%. This mode is perfect for quick capture of objects that will later be refined in 3D design software. Captured data is smooth, and small details are skipped in favour of the overall shape of an object. Installed with SHINING’s latest 3D scanning software update, the Prime is also capable of capturing a object without the need for using stick-on light markers, make the process less labor intensive. The HD Prime operates at a rate of 10 frames per second and, like the EinScan Discovery the distance between scanned point data is typically 0.09-0.12 mm. Southern Manufacturing & Electronics returns to Farnborough from February 6-8, 2018 for its 20th anniversary event. Two decades is a significant achievement for any exhibition, but 2018 marks another landmark for the show and one which perhaps heralds a true coming of age for the longest-running, and arguably one of the most popular annual engineering production shows in the UK. From its earliest beginnings at Thorpe Park, through to a move a decade later to its present site in Farnborough, the show has been housed in a temporary structure which has, given the timing of the show in early February, on occasions proved to be somewhat of a challenge for organisers, exhibitors and visitors alike. However, from 2018, all that will change as the show moves into a new permanent home, currently taking shape on its former site. The brand new £30 million Hall 1 development at Farnborough is a 20,000m² state-of-the-art exhibition centre, featuring world-class facilities, easy access, onsite parking for 3,000 cars and comfortable modern surroundings. Situated at the birthplace and epicentre of the UK’s massive £20 billion plus aerospace and defence industry, Hall 1 looks set to become one of the most important showcases for UK manufacturing expertise and the diverse supply chain that supports it. Southern Manufacturing will be the first major event to be held in Hall 1, and, given the show’s well-established profile as a favourite with manufacturers and industrial buyers, it’s difficult to imagine a more appropriate inaugural event for the largest exhibition venue development in the UK for 20 years. Its location, too, is highly appropriate for the big machinery vendors whose support for the show has been one of the major driving forces behind its consistent growth, particularly over the last decade. Southern is the first big engineering show of the year and the earliest opportunity for serious buyers looking to expand their capacity to check out the latest offerings. With deals closed at Southern worth millions in an average year, it’s an event that is taken equally seriously by vendors. A theme that appears to be developing for 2018 amongst machinery vendors is bringing the versatility and efficiency of 5-axis within the reach of many more firms, particularly those looking to move into 5-axis for the first time. Machines on show from Matsuura, XYZ Machine Tools and Dugard all promise very competitive routes into 5-axis or cost-effective upgrade paths to increased capacity. Matsuura Machinery will be exhibiting the Muratec Murata MT200 turning centre and the single table, entry-level Matsuura MX-520 5-axis machine. The MX-520 has proved popular with firms making the transition from 3- to 5-axis machining. The MT200 is for machine shops running complex parts and various part types through one machine. An optional 3-axis CNC gantry loader provides multiple options for automation. XYZ Machine Tools will focus attention on its UMC-5X simultaneous 5-axis, gantry-style, machining centre. The high-specification and competitive pricing of the UMC-5X is, according to the company, introducing a whole new group of potential customers to the benefits of simultaneous 5-axis machining. Dugard highlights its XP range of vertical machining centres, with five models, ranging from 762 to 2,060mm X-axis travel. Fanuc, Siemens or Heidenhain control options are available, and Renishaw probing and toolsetting. Both Heidenhain and Renishaw are also exhibiting at Southern 2018, the former showcasing an optional variant of its TNC 620 control, which replaces the soft keys at the side of the screen and numeric keypad below with a large GUI touchscreen; the latter showing its new, improved surface finish measurement probe (SFP2) for use on its Revo-2 5-axis measurement system. Those with less lofty aspirations will also find plenty of interest at the show, with enough tooling, metrology and other technology on show to easily fill several days’ worth of browsing. Wilson Tool introduces several new products at Southern 2018: its new Smart-X Storage 4.0 addition to its Industry 4.0 manufacturing environment integrates tool storage with management software; a new QuickTap tapping tool for thick turret punching machines, capable of accurately tapping up to 200 holes per minute, and its new Express Rail 2000 and Express Air press brake clamping systems designed to reduce set-up times and increase productivity. There’s also hundreds of other production hardware products on show, ranging from workspace lighting, oil filtration and storage to workholding, materials handling systems, laser marking, labelling and ergonomic workstations. Southern is also a great place to explore the latest advances in areas such as 3D printing. One of a number of 3D printer vendors at the show, GoPrint3D will be exhibiting a range of machines from manufacturers such as Formlabs, Markforged and Ultimaker. On the stand will be metal parts printed on a Markforged Metal X, which uses an innovative technique to produce functional, pure metal parts at a fraction of the cost of traditional machining methods. This technique also allows for much greater freedom in design, and allows engineers to print geometries that are too complex to be machined in other ways. One of the other well-known names in 3D print exhibiting at the show is TriTech 3D, whose Colin Cater will be one of the expert speakers presenting as part of the show’s firmly established free technical seminar programme. Mr Cater’s case study-illustrated talk on the seemingly boundless possibilities of 3D print is one of no less than 34 sessions running in two theatres over all three days of the show. Some of the other sessions will cover topics such as Lean, implementing ERP systems, Industrial IoT and the future of collaborative robots in the workplace. More immediately, some of the most hotly-anticipated sessions include a practical look at the forthcoming GDPR legislation which comes into effect in May 2018, and how, post-Brexit, existing UK product regulation and standards for manufactured goods and electronics are likely to be affected. All the sessions are free to both visitor and exhibitor alike, but pre-booking is strongly recommended as spaces for the more popular sessions fill up fast. Full details can be found at http://seminars.industrysouth.co.uk. Finally, it’s important to mention that Southern Manufacturing and its co-located Electronics and AutoAero shows, are one of the busiest marketplaces in the UK for engineering subcontracting. Once again, the show’s location means that precision engineering is particularly well represented. Many of the companies present are actively involved in aerospace, automotive and medical technology, in a variety of capacities from machining to surface finishing, through to electronics assembly and testing. A full breakdown of the products and services on show at Southern Manufacturing 2018 can be found at http://exhibitors.industrysouth.co.uk. Visitors registering online will also receive a free 12-page preview magazine and comprehensive show guide, containing full details of what’s on at the event. Southern Manufacturing & Electronics 2018 opens from February 6-8 and admission to the show is free. More information and tickets are available from the website. Farnborough Exhibition and Conference Centre offers free onsite car parking and is easily reached by road, air or public transport. To apply for any of the following job vacancies, please send your CV to grant.cameron@cdg.uk.com with all relevant experience and qualifications. 3D Systems have announced the availability of its new Figure 4™ platform, the industry’s first modular, scalable, fully-integrated direct 3D production platform. Available in standalone and production configurations, the Figure 4 platform combines services, technology, materials and software designed to revolutionize manufacturers’ production environments -- helping customers bridge the chasm and move from rapid prototyping to full production. Figure 4’s ultra-fast print technology combined with production-grade materials enables up to 15x throughput improvements versus competitive offerings, at up to 20 percent lower cost of current manufacturing processes. While 3D Systems’ Figure 4 platform represents an innovative approach to manufacturing, the technology behind Figure 4 has roots in the early days of the company. In 1983, 3D Systems’ co-founder and current Chief Technology Officer Chuck Hull filed a patent for the first stereolithography (SLA) printer, which included many of the processes and ideas found in the new Figure 4 systems. Figure 4 Modular provides customers with an upgradable and affordable direct 3D production solution which includes automated materials-handling and centralized post-processing. As with all Figure 4 units, it is designed to grow with a customer’s business as they move from prototyping to production. With operation from a master control box, each modular unit is capable of producing multiple unique parts simultaneously – saving customers time, money and resources, while speeding time to market. Figure 4 Dental is a single-engine, independent 3D printer with centralized post-processing designed for dental production, prototyping and sacrificial casting. 3D Systems’ portfolio of biocompatible materials makes Figure 4 Dental the only printer on the market to address more than 10 indications. Figure 4 solutions are designed to break down barriers found with traditional manufacturing processes, giving customers streamlined and efficient access to superior quality parts with minimal effort. In order to help customers increase productivity and efficiency, all Figure 4 configurations come integrated with 3D Systems’ 3D Sprint™ and 3D Connect™ software. 3D sprint helps customers address all aspects of print preparation from CAD model repair to automatic placement and support of the part on the print platform – while being able to submit and monitor jobs in the print queue. Please speak to Grant Cameron at CDG for more information. Conformal cooling channels in injection molds have been built by additive manufacturing, or 3D printing. Unlike conventional straight drilled cooling lines, conformal cooling channels curve around deep shapes in a mold, equidistant from the mold surface, which is the source of heat. They can only be built by additive manufacturing (eg. 3D metal printing) and are designed with cooling line requirements secondary only to part and parting line requirements, unlike traditional drilled cooling lines which are located where space is available late in the design process. All that makes “100% metal mold inserts possible with reasonably smooth surfaces, providing a rock solid tool for mold makers,” explains Scott Young, engineering manager at Bastech Inc., Dayton, OH, a service bureau for additive manufacturing since 1994 and a reseller for 3D Systems. Bastech has built molds using additive metal manufacturing since 2000 and using pure metal additive manufacturing since 2015. Conformal channels themselves, however, haven’t changed much in two decades of development. Primary cooling channels can transition to small capillary channels and back to primary trunk lines again to get cooling closer to the mold surface or to cool small mold details. Capillary channels can be closer together than large channels. (The cross section of the supply channel has to be equal to or greater than the sum of the cross sections of the capillaries, and the cross section of the return line has to be equal to or less than the sum of the cross sections of the capillaries.) But conformal cooling channels themselves are still typically round like drilled water lines. But round may not be the best channel shape, according to a recent study by Bastech, presented at the AMUG 2016 conference in April in St. Louis, MO. Bastech compared cooling efficiency of round, square, diamond, tear drop, triangular tear drop, and triangular channels, based on surface cooling area calculated from channel perimeter. So for channels with the same length and volume, the channel with the longest perimeter will have the most surface area and cool best. Using 3D System’s Cimatron 13 software, Bastech compared a round channel with a 1.374 inch perimeter to the other shapes and found that a tear drop has a 1.454 inch perimeter; square has a 1.474 inch (rotating the square into a diamond shape has the same perimeter but is structurally stronger in a mold); triangular tear drop has a 1.574 inch; and triangular has a 1.587 inch. So a triangular channel cools 16% more efficiently than a round one. “More important, triangular channels have a long flat surface that can be oriented to parallel the mold surface,” Bastech’s Young points out. Bastech simulated five cooling channel shapes—round, square, tear drop, triangular tear drop, and triangle–rotating some shapes for better mold strength and orientation to the mold surface. Triangular channels have 16% more surface area than round, which are the least efficient. The most complex conformal channels Bastech has built so far were done this year for a mold core for an in-house promotional product, a 5-inch-tall cold drink sleeve. The 8-inch high mold core, also presented at AMUG 2016, is cooled by two inter-twined helical flow channels with X-shaped cross sections (X’s have even more surface area than triangles). The supply side channel splits to start one helix at the base of the core and the other helix and the top, creating counter flow, shorter channels, and more even cooling. The helical channels then reconnect into the return line to exit the core. Bastech built this highly unusual conformally cooled mold core with two X-shaped helical cooling channels. One runs straight to the top of the core and coils down. The other coils up, intertwined with the first for counter flow, shorter channel length, and better cooling. Bastech also used additive manufacturing to reduce the mass of metal in molds, but it wasn’t to increase cooling water volume. It was done because less metal in the mold means faster mold start up and shorter additive manufacturing time. “We only need 0.25 inches of tool steel for mold walls, plus an inch or so for the cooling channels. Everything outside of that we don’t need,” Bastech’s Young explains. For the drink sleeve core instead of a solid metal mold, Bastech built a structure of trusses and supports, leaving diamond shapes of metal out and removing roughly 25% of the metal. The drink sleeve core took only 38 hours to build vs. 42 hours for CNC programming and machining to build the same core out of solid tool steel with conventional spiral baffles. For more information on Conformal Cooling, Mold Design and Additive Manufacturing of the Mold, please contact Grant Cameron at CDG. Tel 01420 88645. VisiJet Armor is ideal for applications requiring a balance of strength and toughness in a clear material. A tough, ABS-like clear performance plastic, VisiJet® Armor M2G-CL material for the ProJet MJP 2500 Plus exhibits an exceptional mix of tensile strength and flex. Versatile across a wide range of applications, VisiJet Armor delivers advanced prototyping performance to meet almost any engineering need. VisiJet GRY material exhibits rigid function with a rigid primer grey finish. The high visual contrast of VisiJet M2R-GRY makes it ideal for functional applications requiring accurate detailing. As a USP Class VI certified material, it enables use in medical applications such as surgical guides. High contrast rigid grey plastic is exceptional for viewing details. VisiJet® ProFlex M2G–DUR material is ideal for living hinge applications as well as a range of applications requiring durability and extreme pliability. This polypropylene-like semi-rigid clear plastic delivers an effective combination of high impact resistance and extreme flex to provide robust engineering-grade performance.